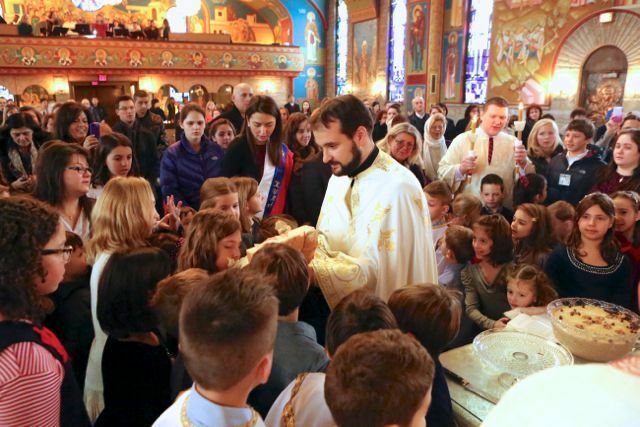 Chicago, IL - This year, as every year, Holy Resurrection celebrated St. Sava, the first archbishop and enlightener of Serbs, as the patron saint of education and learning. This year’s celebration was slightly different then the previous years, namely, our parish grew so much in size that the current facilities were insufficient to hold the participants and parishioners and the celebration had to be extended to a three-day event. On Saturday, January 25th our “Soko” Folklore group and the “Junior Brankies,” the children’s section of the Cathedral choir SSS “Branko Radichevich,” celebrated their patron saint. The kumovi of the celebration were Tanja Vukoja and Marko Savich. The festivities began with the Vespers service and the Slava blessing in the church. The celebration continued in the Social Hall, where our folklore, children’s choir, and drama club performed. The “Soko” Folklore group presented a medley of Serbian dances. All three age groups took part in the celebration. Demonstrating a great amount of skill and artistic ability all 270 children of the group honored St. Sava. We are very grateful to Marija Markovic and everyone who helped “Soko” grow in the past few years to become an admirable folklore ensemble. Special gratitude goes to the choreographers Milan Andrijanic, Duska Kangrga, and Jovan Aleksic. The sheer magnitude of this year’s celebration of St. Sava at Holy Resurrection Serbian Orthodox Cathedral in Chicago is truly a splendid encouragement to the priests and parishioners that our church and our Serbian people are remaining faithful to the Way of St. Sava, i.e., Svetosavlje. Their love for our orthodox faith and our Serbian culture is a powerful testament to the continuation of the legacy of St. Sava on this side of the Atlantic. May St. Sava continue to bless us and protect us on MANY YEARS!